Throughout his 16-year NBA career, he dropped a whole lot of buckets and set fashion trends off the court with his ensembles over the years. D-Wade will go down as a Hall Of Famer and one of the best-dressed athletes of all-time. The 37-year old hooper made sure to stand out for his last two NBA games. It was only right for Wade to go out in style. 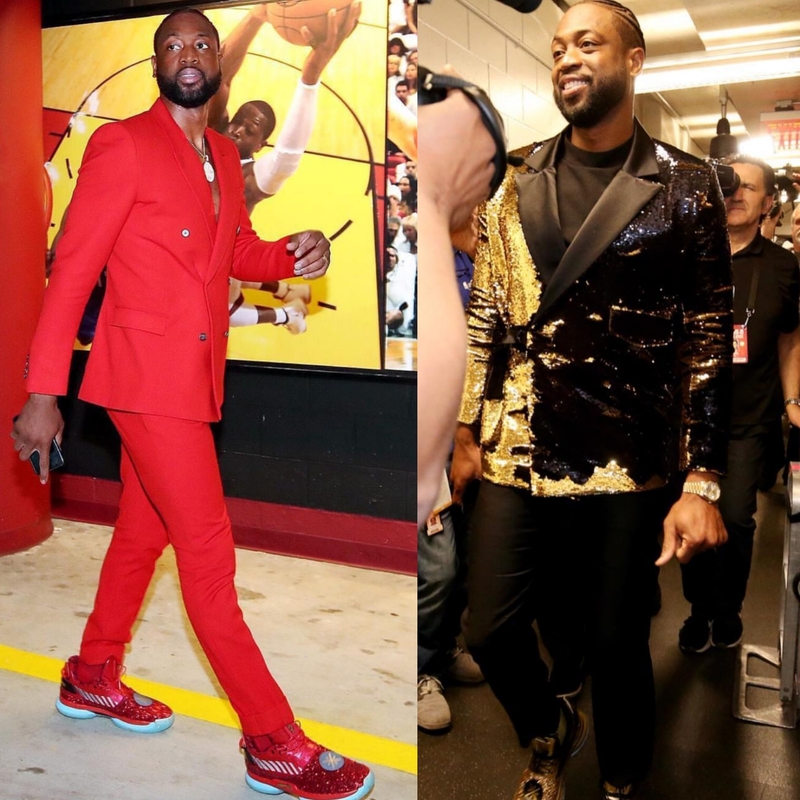 He arrived at American Airlines for his final home game sporting a bold Givenchy red suit paired with his signature Li Ning Way Of Wade 7 red sneakers. At Barclays Center last night Wade shined for his official last game sporting a lustrous sequined gold and black double-breasted blazer coordinated with another pair of Li Ning Way Of Wade 7 kicks. Miami Heat Dwyane Wade Brings Style To Li-Ning STYLE: NBA Dwyane Wade Covers ESPN The Magazine ‘The Money Issue’ Dwyane Wade Debuts His Latest Collabs With Stance Socks & Li-Ning Footwear STYLE: NBA star Dwyane Wade Is Letting Fans Shop His Closet VIDEO: NBA Dwyane Wade Supplies Hublot Watches And Custom Suits To 15 Foster Kids.